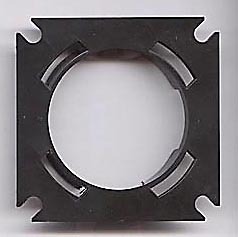 Description: Black square turntable piece with a round hole in the center. There is a raised rim around the center hole with raised 4 pegs on the rim and 4 holes on the square base beside each peg. The pegs connect to the inside rim of the FPT16734 turntable piece. Therer are U-shaped holes in the corners of the square base. Measures 2-7/8" square. 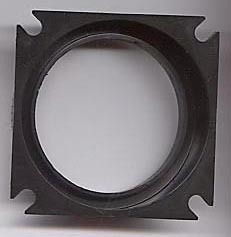 Description: Black square turntable piece with a round raised rim and hole in the center. The raised rim has ribbed lines on the sides. The corners of the square base have U-shaped holes in the corners. Measures 2-7/8" square, 11/16" tall). 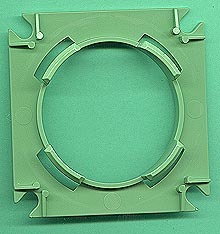 Description: Green square turntable piece with a round hole in the center. There is a raised rim around the center hole with raised 4 pegs on the rim and 4 holes on the square base beside each peg. The pegs connect to the inside rim of the FPT6575 turntable piece. Therer are U-shaped holes in the corners of the square base. Measures 2-7/8" square. 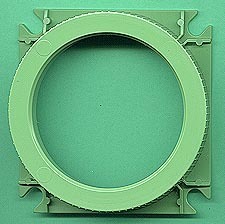 Description: Green square turntable piece with a round raised rim and hole in the center. The raised rim has ribbed lines on the sides. The corners of the square base have U-shaped holes in the corners. Measures 2-7/8" square, 11/16" tall).